Power Supply unit for use in high end Audio Amplifiers. Based on ultra fast soft recovery discrete rectifiers, with very low noise and a recovery time of just 35nS. These diodes are much faster than cheap standard bridges, and thus create less noise when the diode switches off. This is essential for enabling the best possible sound in any amplifier. 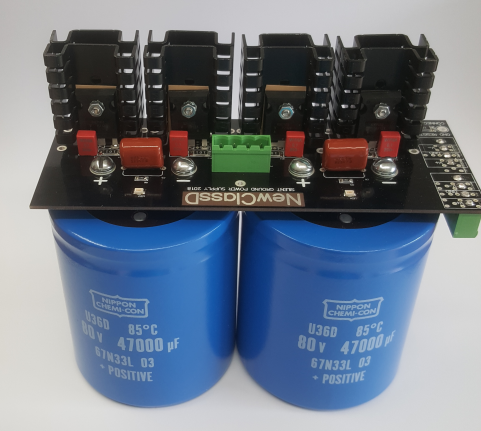 The power supply module is intended for use with a toroid or other 50/60 Hz transformer with 4 secondary wires. It cannot not work with a 3 wire transformer. One of the important features of this module is the silent GND point. The charging current to each capacitor, can reach more than 100 Ampere peak, and if passing through a GND point, such as star GND, will create vast amounts of disturbing noise. A noise that can be very hard to eliminate. Not here! The charging current passes directly to each capacitor, through it's own bridge. So that is why there are two bridges, rather than the usual one. The two capacitors are then conencted in the GND point only, and there is no charging current spikes in that point, in fact there is no current at all, making it silent. 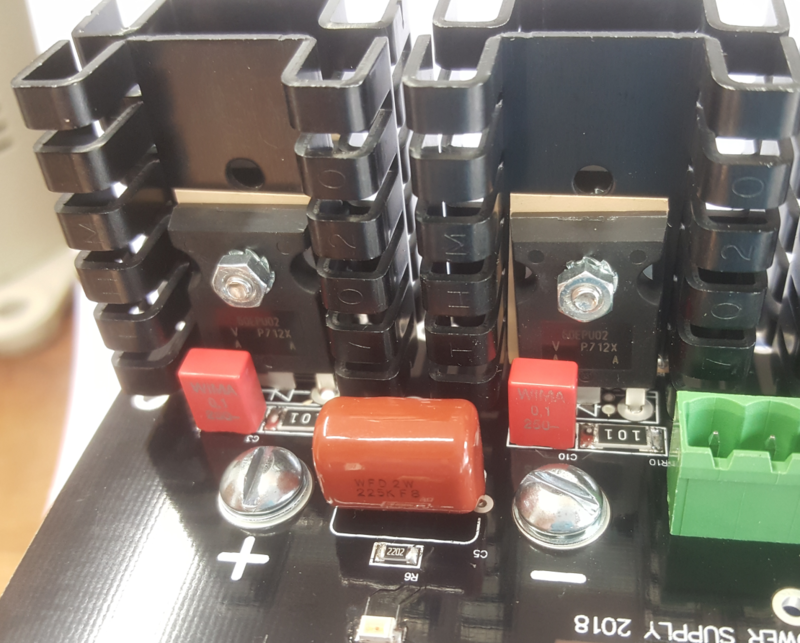 To further eliminate noise from the transformer a snubber network is connected across each diode, consisting of a non inductive power resistor, and a high quality WIMA film capacitor. This network will dissipate any remaining switching noise, and you can hear the difference!. This power supply unit is suitable for up to 80V DC rail voltage. 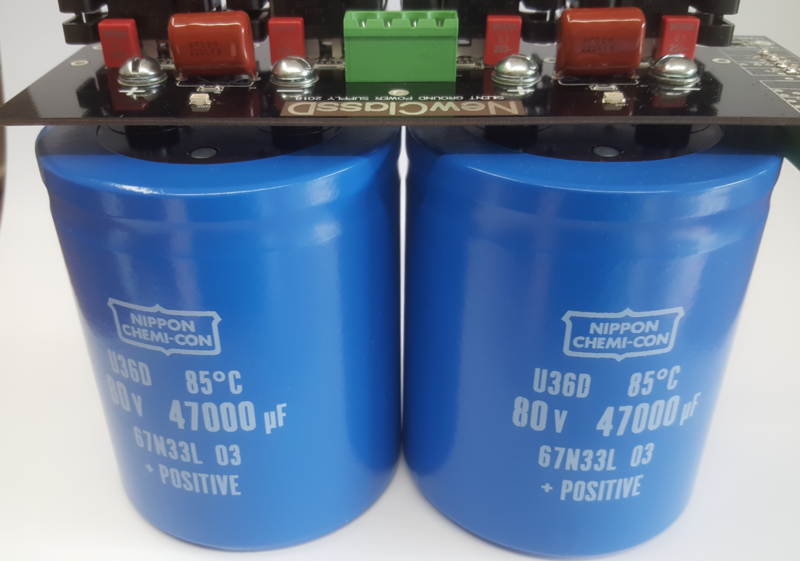 The capacitors are expensive high grade types, made in USA, and can safely operate at rated the voltage in it's entire period of life expectency, which is based on our experience 30 to 40 years. 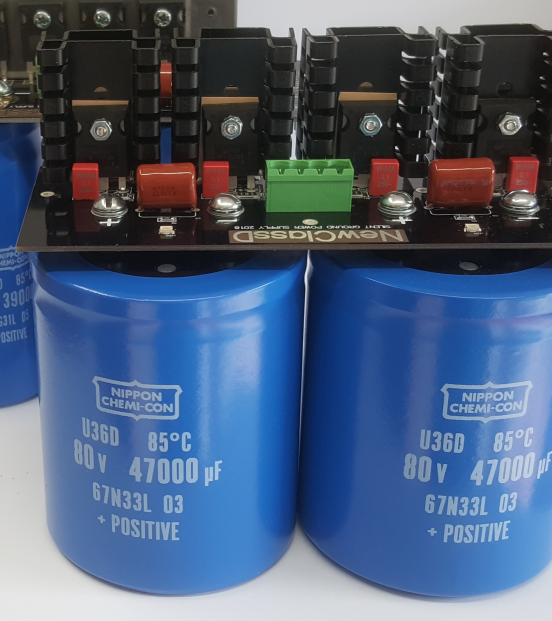 Transformers with a secondary voltage of up to 55 V AC is suitable for this power supply, but for NCDV 2 module, we recommend only up to 50 V AC secondary voltage. So in other words a perfect match for NCDV 2 amplifiers. The build quality is a 4 layer board with two solid copper planes in the center, for extreme low impedance. In previous versions we used a Gold finish, for good contact and good looks, however we found that the Gold layer was deposited on a relatively thick layer of nickel.  Listening tests revealed that the nickel layer could have a negative impact on the sound quality, so we found that pure silver deposited directly on copper is much better. 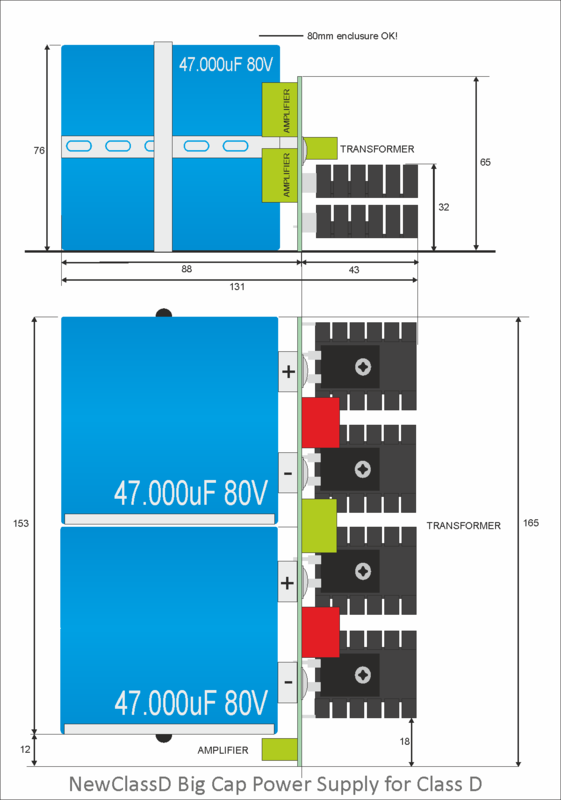 This is the surface technology we use in this power supply unit. 47.000 uF or 100.000 uF? 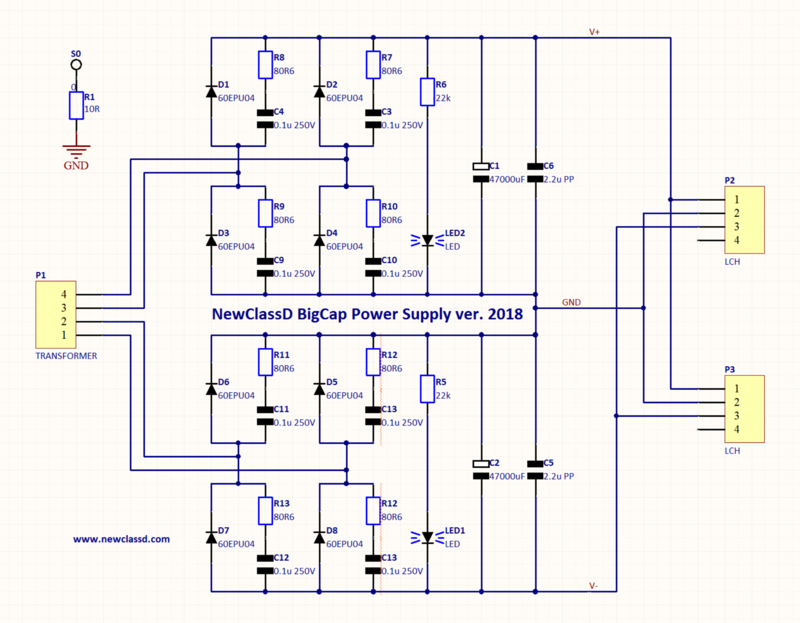 This version of power supply is only available in 47.000 or 100.000uF values (for each capacitor). 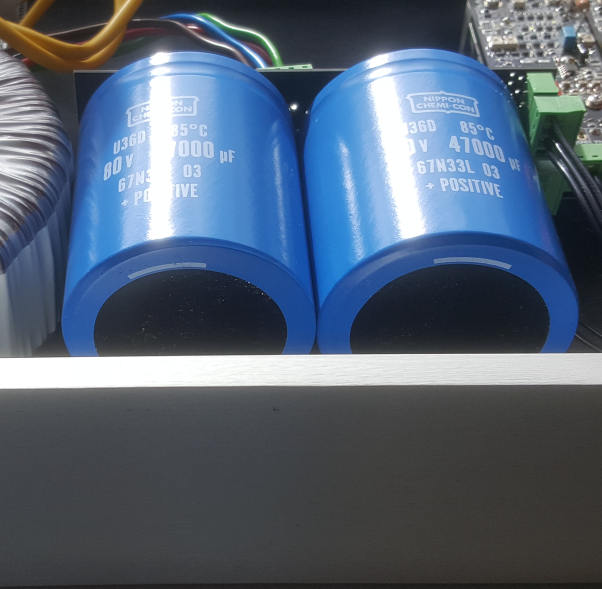 These are 3" diameter capacitors, and the whole unit will fit inside a 80 mm height enclosure. For most speakers the 47.000uF version is optimal, and will give a grand sound experience with a large soundstage, and plenty of control. Only in cases where extreme amounts of control is required, say if you have 18" subwoofers in a large enclosure, and you need to tighten the bass up, then we recommend the 100.000uF version. Capacitors smaller than 3" (76 mm) will not fit on this power supply. There is a GND resistor on this module, to allow floating GND connection to the metal enclosure. This is simply to remove risk of hum and noise on the enclosure. When assembling the capacitors, make absolute sure the each + terminal goes to + on the PCB. If a capacitor is reversed, the capacitor can disperse liquid, and make bad smell. Tighten the screws well, but not very hard, as it could damage the PCB.